The Wirehaired Vizsla originated in Hungary. The idea of a Wirehaired Vizsla came mainly from hunters and falconers beginning in the 1930s. 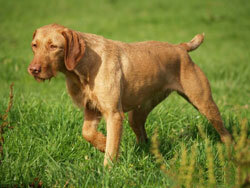 Wirehaired Vizslas are a good versatile hunting dog, and are well suited for families. Due to the athletic nature of the Wirehaired Vizsla, regular exercise is a necessity. They are eager to please and easy to train using positive methods. 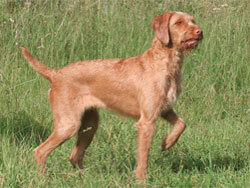 The Wirehaired Vizsla is a versatile, natural hunter with a good nose and good trainability. Although they can be lively, but gentle mannered, affectionate and sensitive, they are also fearless and possessed of a well-developed protective instinct. They are staunch on point, a good retriever, and are good water dogs. This is a dog of power and drive in the field, yet is a affectionate companion in the home. Additional breed information for the Wirehaired Vizsla can be found at the American Kennel Club website.